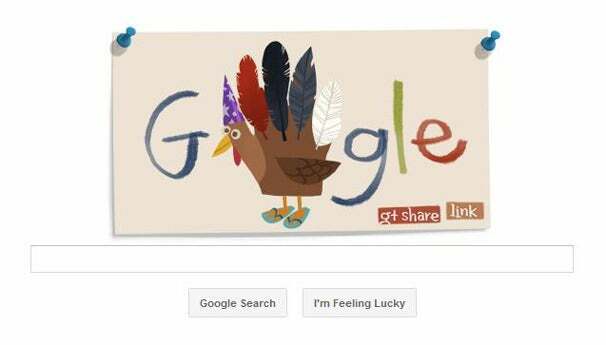 Google's latest doodle, which debuted Tuesday, is unmistakably a virtual hand turkey to celebrate Thanksgiving. Don't remember what a hand turkey is? When I was in elementary school we used to make "hand turkeys"--that is, we traced our hands on a piece of paper, and then turned them into rudimentary turkey figures using colorful construction paper. 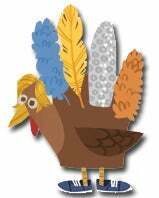 The doodle, which will presumably last through Thanksgiving, allows users to customize their own virtual hand turkeys by clicking on various parts of the bird. There are six customizable pieces--four feathers, the turkey's hairstyle, and the turkey's shoes--each with 12 different options. Options include multi-colored feathers, tinfoil, roller skates, football helmets, and eye patches. If you're too lazy to customize each individual piece of your turkey, you can also click the wing to get a random selection of feathers, hairstyle, and shoes. Once you've successfully created an epic Kindergarten-esque masterpiece, you can share it on Google+ directly from the Google page, or you can grab a link and share it with other (non-Google+) people. 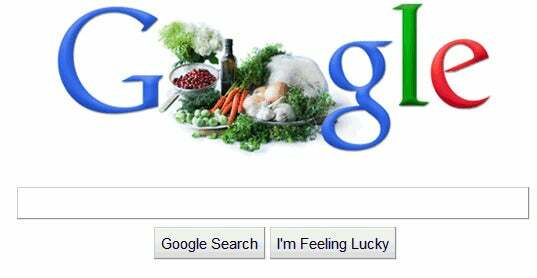 Last year, Google posted a Thanksgiving dinner-themed doodle, complete with recipes for each dish, courtesy of the Barefoot Contessa's Ina Garten. In 2009, Google posted a Snoopy-themed Thanksgiving doodle. The doodle should be up through Thanksgiving, and may receive its own page if it ends up being popular enough (and a lot of interactive, "create-your-own" Doodles do). There are 2,985,984 different turkey combos you can make, so…get crackin'.